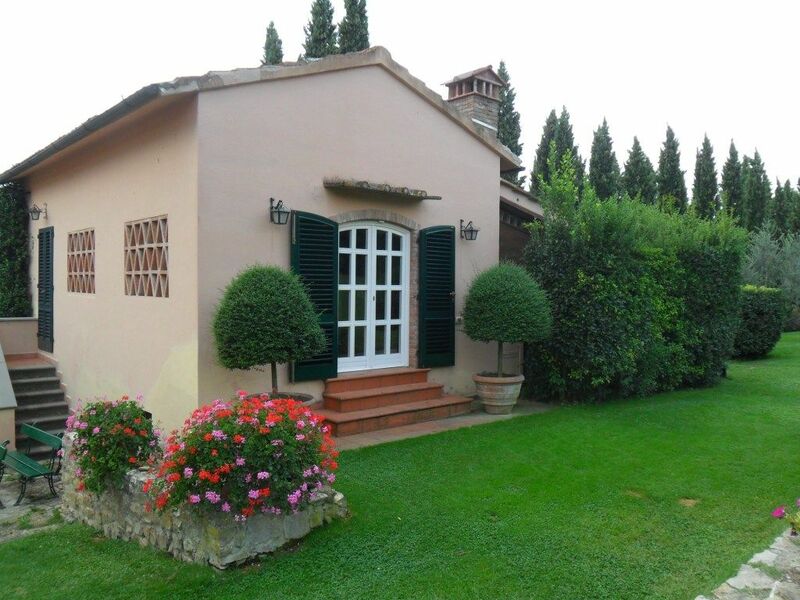 Beautiful Cottage surrounded by the Florentine country side with a beautiful garden, heated swimming pool, tennis court and stables. 1 bedroom, wide living room with 2 single sofa beds and fireplace, kitchen, dining room and bath. Private patio with table, chairs & loungers for dining out. The swimming pool is in common with the other 2 homes of our Estate. The perfect place for a peaceful & relaxing vacation in harmony with nature, make excursions in the Chianti, enjoy horseback riding & golf experiences, tennis and also for shopping (Gucci & Prada Malls are 20 km away). The house can host up to 4 people. Our family have purchased this property 40 years ago and refurbished it completely creating a beautiful garden with 700 olive trees, one private pool with jacuzzi, tennis court and stables for my sister's 2 horses as she plays polo and works with kids as hypnotherapist. The entire property consists of three homes : my parents villa, my sister villa and a charming 1 bedroom cottage that can host up to 4 persons available for holiday rentals as well. Our property is located on a small hill therefore the surrounding country view is just relaxing and peaceful. The village is just 1 km away close enough for any needs but far away from traffic. We purchased this property for summer vacation and holidays escapes from town. After we spent our first summer here we fall in love and never went back to our former home in town. Florence is only 3 km away and access to highways is at 2 km. In the last 20 years my family has welcomed many friends and they all just loved our unique place. Swimming pool, Jacuzzi Pool, tennis court and horse back riding on site. 18 holes golf course at 4 km. Sink, toilet, bidet and shower. Extra charge for weekly rental. Extra charge for long term rental. Pool is in common with all three homes of our property. The cottage was perfect and exactly as described. The owners were very helpful and friendly. Hope to return next time we're in Tuscany. A clean, spacious apartment in a stunning location, close to Florence and other local amenities. We were made to feel very welcome. Our little ones enjoyed discovering the gardens and swimming in the rather wonderful pool. Gorgeous setting- owners really friendly and helpful. Grazie mille per l’olio d’oliva! Lovely house, fabulous pool and gardens. Grazie per la gentilezza. Ci siamo rilassati sul serio. Very peaceful and relaxing. A real find - we’ ll be back! Beautiful property in darling Grassina! Host is extremely helpful and very kind. We hope to return again someday. From CA to Grassina and well worth it. The property was absolutely beautiful, I cannot say enough about it. Plenty of room, clean, charming, everything worked perfectly. We were greeted with fresh fruit and a nice bottle of Chianti Classico. We enjoyed sitting by the pool after a full day and just relaxing, we enjoyed cooking our meals in the quaint little kitchenette. We enjoyed the sunset while sitting outside at out back table having a glass of wine. I would not hesitate to stay there the next time we are in Italy, in the Tuscany region. It was only a 20 minute drive to Florence and about an hour to Siena. Horseback riding and golf activities are available in the surrounding area. This pleace is just perfect for your excursion in the Chianti area and relax in the beautiful Tuscan country. Prices are subject to change until reservation in confirmed. The rental price includes final cleaning expences. City tax in the amount of € 1,50 per person per night for a maximum of 7 nights must be paid upon arrival. The tax doesn't apply to children under 14 years old.